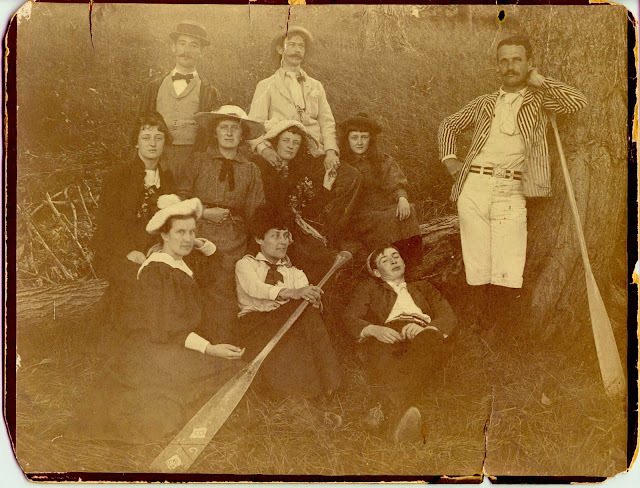 Found another historic image (1892) of members of the Brantford Canoe Club. Seated on the floor holding a paddle with B / C / C decorated on the blade is a future International celebrity, Mohawk Poet and Performer, E. Pauline Johnson (Tekahionwake). A gentleman on the far right leans against a paddle with some interesting features. The throat of the blade has carved notches where it meets the shaft. Likewise, the base of the pear-shaped grip also has decorative notches. The pattern is not unlike a late 19th century one used by the Lakefield Canoe Company featured in an earlier post here.